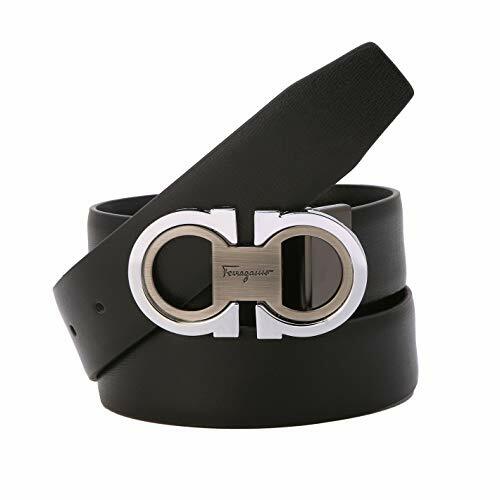 Vonsely fancy leather belt is with high quality silver alloy buckle, stylish and practical, easy to match different outfits. 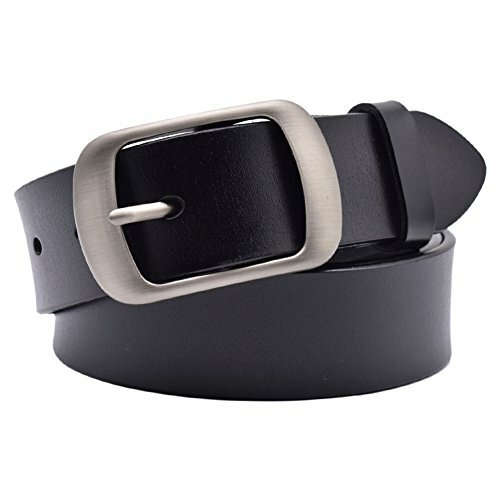 This plain soft leather belts is both great for everyday casual wear and special occasions. If you like this leather belt, but the belt size is too large for you, you can DIY the belt to the size you need. Following is the way to adjust the belt size by yourself. 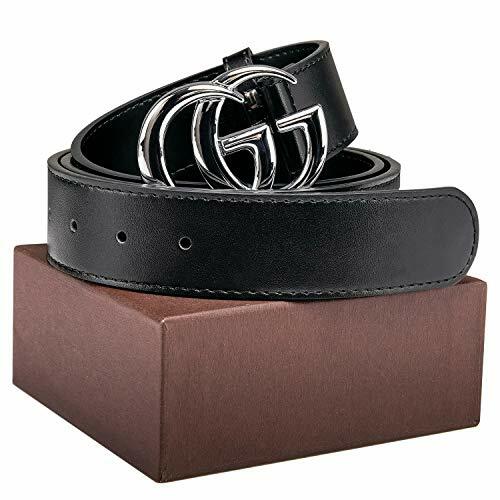 You can make the leather belt to the length for perfect fit if the belt is too long for you. (Please check picture for reference.) ---1. To loosen belt from buckle- easily unscrew the screw beside the buckle with a screwdriver. ---2. Cut the belt to your desired size and make a new hole on the belt with the puncher.---3. Secure it firmly with closure. Warm Tip: 1) There may be tiny difference of the size because of the manual measurement. 2) Color and material will be slightly different because of display color factors and artifact shooting.Service & Warranty: 1)Welcome to contact us via email if you are not satisfied with our products, we 100% assure to give you a satisfactory answer within 24 hours. 2)Any quality problems with our products, 100% Resend or MoneyBack guarantee. Click the Add to Cart to Get your style! Vonsely ladies leather belt is with high quality alloy buckle, stylish and practical, easy to match different outfits. This ladies leather belts is great for everyday casual wear and special occasions. 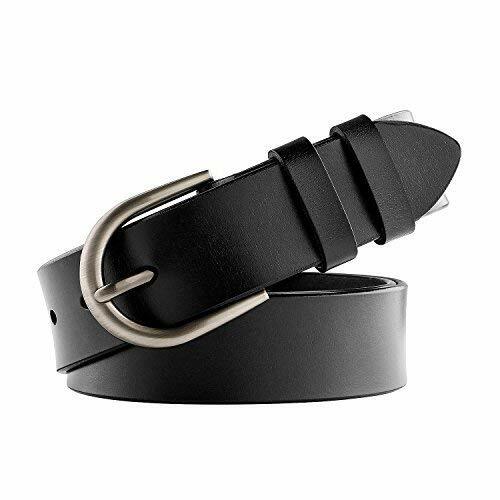 You can make the leather belt to the length for perfect fit if the belt is too long for you. (Please check picture for reference.) 1. To loosen belt from buckle-easily unscrew the screw beside the buckle with a screwdriver. 2. Cut the belt to your desired size and make a new hole on the belt with the puncher. 3.Secure it firmly with closure. Warm Tip: 1) There may be tiny different of the size because of the manual measurement. 2) Color and material will be slightly different because of display color factors and artifact shooting. Service & Warranty: 1) Welcome to contact us via email if you are not satisfied with our products, we 100% assure to give you a satisfactory answer within 24 hours. 2)Any quality problems with our products, 100% resend or MoneyBack guarantee. Perfect fitIf the belt is too long for you, you can trim the strap length to fit your size.Two simple steps:--- 1. To loosen belt from buckle - with a plier gently lift closure to remove belt from buckle.--- 2. 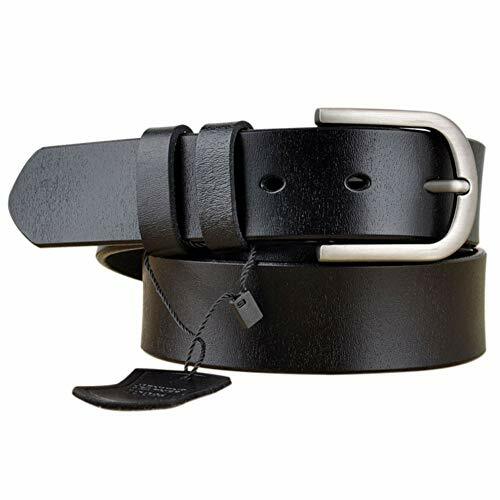 Cut the belt to your desired size and secure it firmly with closure.You're no longer restricted to 1 inch size adjustments, but can get a perfect, superb, and custom-fit all the time!High Quality BuckleWe choose high quality metal buckle . 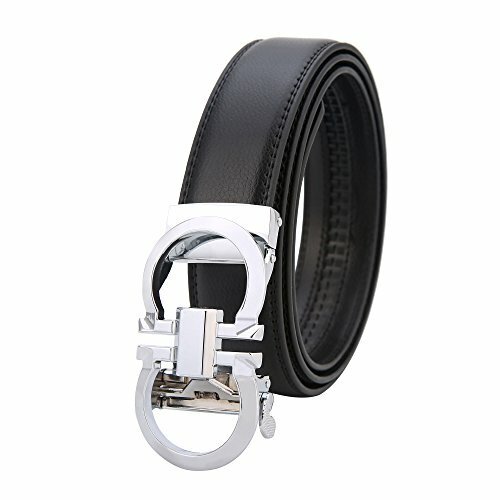 Our buckle has high resistance to rust,corrosion and tarnishing, which will be shiny as a new one even years later.Advanced MaterialOur belt is made of Genuine Leather, which feels smooth, comfortable and can last long time.To maintain the leather, we should keep it away from sharp items, oil, chemicals, and heat source. Clean it with dry soft cloth when got stains.Best Gift For Your Friends And FamiliesTimeless design , for every gentleman of all ages and for all occasions! It is one of the most special gifts for Groomsmen, Birthdays, Anniversaries, Father's Day, Christmas and other Special Occasions. 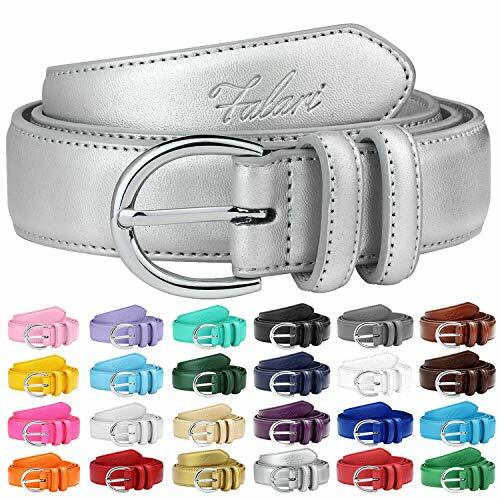 Color: Gold/Silver (optional) Packing: Each Belt is in a Separate Gift Box Size: *-* 42 "(105cm) is suitable for 30-32 waist circumference. *-* 44 (110 cm) is suitable for 32-34 waist circumference. Classic fashionable design, suitable for all places to appreciate, suitable for all jeans. 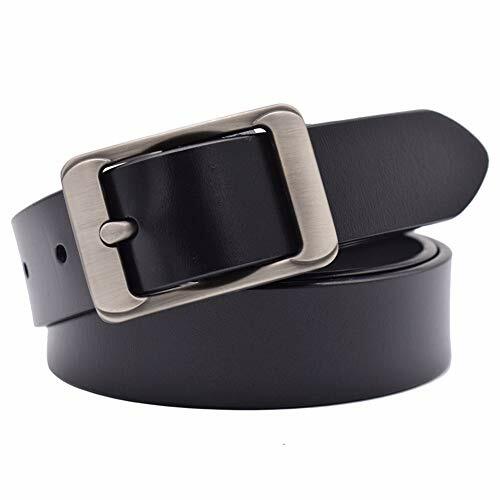 Size Reference: waist size 20-33 advised belt size 20-37'' waist size 33-38 advised belt size 37-44 waist size 43-47''advised belt size 45-51 Packing list: Gift Box*1 Belt*1 Bag*1 How the belt is measured: The belt is measured from buckle end(not including the buckle) to the first hole and the last hole of the other end. 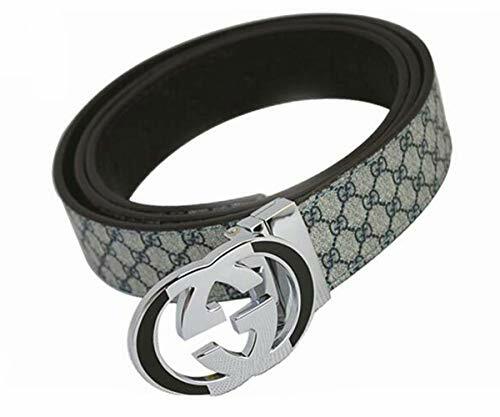 Size 34-39 belt means it is 34" long from the buckle(not including the buckle) to the first hole of the belt and it is 39" long from the buckle(not including the buckle) to the last hole of the belt. And the same idea for other sizes. How to trim: With one hand grab hold on the leather and the other pull and twist the buckle. So it looks like a plus sign. The metal opens like a hinge from the inside, don't force it.. it only opens one way. Pry open with a small screwdriver or other flat object. Then remove the belt, trim and put it back together. Then press the buckle and rotate it back. It is easy to handle. There are 5 grommets in the belt, so it is ok for you to choose your approximate pant size. 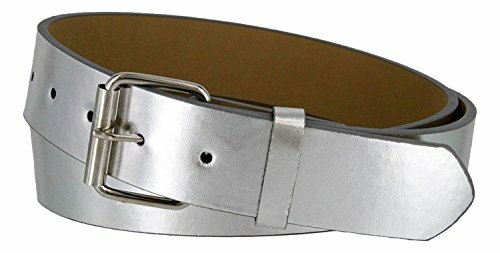 B570 Mens Genuine Leather Belt With Silver Roller Buckle 1 1/2" Wide. Our Belts are measured from the fold to the center hole at the tip end. Measure your current belt from the hole where you wear the belt in order to get the best size.